There are several great British movies about trains- Oh, Mr. Porter! and The Lady Vanishes being just two of them. To this pairing can be safely added Train of Events, which, though made about ten years later than the previous two, is highly worthy of their companionship. Like its forebears, the sheer economy of this 1949 film is noteworthy- after an energetic and classy titles sequence (including the train thundering through the studio logo), the whole premise of the film is established- a train leaves from Platform 13 at Euston Station bound for Liverpool, and is involved in an accident. The film then looks back over the disparate group of characters on board and how they came to be making the journey in the first place. It is perhaps a deceptively simple premise, but the effect of having the present “book-ended” in this way is startlingly effective, combining as it does knowledge of what will happen to these people with intricately formed character studies with which Ealing is associated. Train of Events is a film that is very much the sum of its component parts- though as with the best portmanteau films each part is a success in its own right. Taking its cue from a film like the earlier Dead of Night, Train of Events weaves together four stories that explain how its protagonists find themselves on the same locomotive, the scenarios painted with an almost tangible post-war air (the austere yet quaintly beautiful streets are photographed sumptuously, with more than a hint of film noir in their appearance. This is particularly seen in Philip’s walk home from the theatre, the striking compositions and fluid camera movement being both unusual for a film of this era and stylishly effective in conveying the malaise of the late 1940s in a country still struggling on the road to recovery. An Ealing film (and therefore bringing with it no uncertain amount of cinematic “baggage”), Train of Events boasts a surprisingly large crew list as it features multiple directors and cinematographers – different people assigned to different segments- which, in theory, could make certain parts of the film weaker than others. That this does not happen is a testament to the sheer artistry of those involved, and also to the excellent cast, which includes many Ealing regulars. Overall, what makes Train of Events worthy of note in the Ealing canon is its economical effectiveness- it tells a story of sadness, laughter, envy, hatred, love and aspiration in under 90 minutes. Being part of the Ealing tradition is a hard thing to live up to, but Train of Events manages it without much of a struggle. 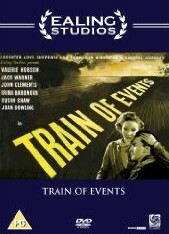 Train Of Events is available on DVD from Optimum Home Entertainment.